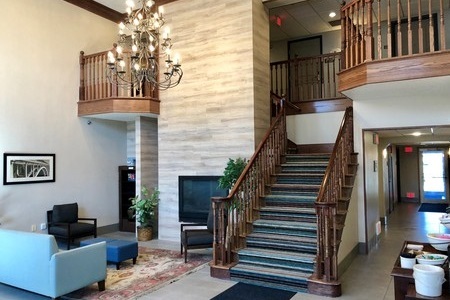 At the intersection of I-94 and U.S. 83, the Country Inn & Suites® by Radisson, Bismarck, ND places you near the heart of North Dakota’s capital city. Visit your student at nearby Bismarck State College, or drive less than four miles to attractions like the Capitol Building and the Bismarck Event Center. When you’re finished perusing the shops in downtown Bismarck, head to spots like Sertoma Park or Fort Abraham Lincoln State Park to appreciate the area’s natural beauty. Here on a long business trip? 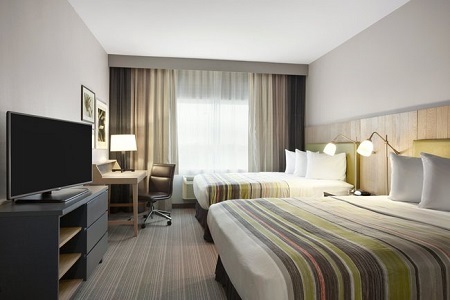 Book an Extended-stay Suite to feel at home with amenities like a private bedroom, a separate living room and a dining area. 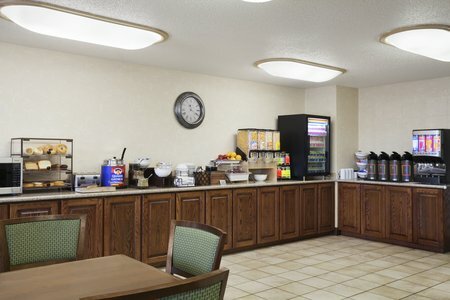 Make a good morning great with our hotel’s free, hot breakfast, which includes fresh waffles and daily specials like French toast. For lighter fare, pick up fresh fruit and some yogurt. When you’re ready for lunch and dinner, choose from several nearby restaurants, like Space Aliens Grill & Bar, where earthlings of all ages are welcome. Enjoy a pizza or a burger, and then head to the Galaxy Game Room for fun that’s out of this world. Bismarck Event Center – For the most exciting eight seconds of your day, get a ticket for the PBR bull-riding competition, one of the most popular events at the Bismarck Event Center. You can also catch a concert or a comedy show at this venue located 10 minutes from the hotel. Dakota Zoo – Spend an afternoon watching energetic river otters and beautiful snow leopards at the Dakota Zoo, just 15 minutes away. Be sure to take the 30-minute train ride around the zoo for a unique view of each exhibit. Kirkwood Mall – Forget your swimsuit? Kirkwood Mall is the city’s largest shopping center and is less than four miles from the hotel. Find your favorite brands and bargains, or enjoy a meal at the food court. Host an event for up to 80 people at the Country Inn & Suites, which offers a meeting space with free Internet and audiovisual equipment. You can also plan a pool party at the hotel for your next birthday or family celebration. Want to keep your guests informed of all event details? Our friendly staff is happy to create a custom website just for your gathering.